DP president Norbert Mao speaks at a past event. File photo. 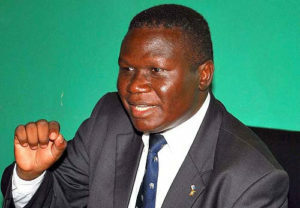 Democratic Party president Norbert Mao has this morning launched the ‘Togikwatako’ Red Week, a campaign aimed at barring legislators from scrapping age limit caps in the Constitution to allow President Yoweri Museveni, whose current term expires in 2021, to run for another term of office. “Tokikwatako has given all democracy seeking forces a new identity – The Red Ribbon. The Red Ribbon symbolizes this new identity. An identity that transcends our narrow confines of party, tribe and religion. It an assertion of power. A declaration that we have found a common voice,” Mao said during a press briefing in Kampala this morning. He urged Ugandans to unite for a common cause, adding that when slaves unite, the Red Sea of oppression will part creating a clear path to a democratic future based on truth and justice. “Unlike previous struggles that were seen as struggles of political elites scrambling for the spoils of power, Togikwatako is a campaign championed by ordinary people. Its momentum can only be built if the people are organized inspite of the repressive and menacing state machinery,” Mao said. Mao’s comments come as MPs meet today (Tuesday) afternoon to debate on the proposed Constitutional amendment aimed at scrapping the presidential age limit. On July 20 2017 we launched the campaign now embraced by Ugandans across parties and all walks of life. It has provided a most vital ingredient to our struggle for democracy in Uganda. It has become the strongest glue bringing together people hitherto divided by narrow interests. This campaign has to a large extent stemmed the tide of cynicism that has been spreading among citizens. Many in our society have become resigned to a view that elections don’t make a difference. That it is the will of those who oversee the counting of votes rather than the votes themselves that count. Elections have degenerated into an empty ritual. That is the reason why there continues to be overwhelming dissatisfaction with a President who claims to have won with over 60 percent of the vote and whose party controls almost 80 percent of parliament. In this campaign we endeavor to be inclusive and to conduct ourselves with respect towards one another. We do not say “if you’re not for us you’re against us”. Rather we say with the Nazarene Master “if you’re not against us, you’re either us”. Tokikwatako has given all democracy seeking forces a new identity – The Red Ribbon. The Red Ribbon symbolizes this new identity. An identity that transcends our narrow confines of party, tribe and religion. It an assertion of power. A declaration that we have found a common voice. A voice that will not be silenced no matter what happens to us as individuals. Under the banner of the Red Ribbon, political factionalism and intra party squabbles will be dissolved. Our unity will continue to grow the more we struggle together. Unity will be forged in the crucible of the common arena of struggle. The Museveni regime has managed to rule Uganda for so long because of its divide and rule politics. A man who claims a copyright to the vision of East African unity and Pan-Africanism is busy balkanizing and dismembering the social fabric of Uganda. Each clan can now get a district on demand. The only condition is total allegiance to Museveni. Cultural leaders are being enthroned day and night. Some had never been heard of before. Museveni has institutionalized administrative tribalism where so called indigenous populations are incited against so called “local immigrants” or “bafuruki”. Museveni has managed to turn our differences into a political tool to keep citizens in servitude. We need to find a medicine for this divide and rule. We should bridge the differences and undermine Museveni’s efforts to exploit those differences. Lets unite. When slaves unite the Red Sea of oppression will part creating a clear path to a democratic future based on truth and justice. Above all the Togikwatako campaign has seen an unprecedented surge in the participation of young people. It is largely an uprising of the youth demanding that their elected parliamentary representatives do not usurp their sovereignty. Unlike previous struggles that were seen as struggles of political elites scrambling for the spoils of power, Togikwatako is a campaign championed by ordinary people. Ordinary people are the main actors. Togikwatako is thus a popular struggle. It’s success will depend on the momentum of numbers. This momentum can only be built if the people are organized inspite of the repressive and menacing state machinery. As we protest demanding our democratic rights we no longer face water cannons and Teargas canisters. We stare fearlessly into that barrels of machine guns and armored personnel carriers. Our legislators deliberate under the shadow of the gun. Parliament is under siege by military force. It looks like a war zone rather than a house of people’s representatives. The civil police has been supplanted by military personnel who start with force and keep escalating the level of force. It is in that environment that our legislators return today. The question is simple. Will we allow the house of peoples representatives to be turned into a brothel, a casino and a marketplace for money changers? Shall we allow the blind followers of one man’s despotic ambitions to enact a fraud into law? Those MPs who have remained faithful to the will of the people faced police brutality as they sought to consult. Those who have allowed themselves to become accomplices to tyranny were facilitated and protected by police to bribe a handful of their constituents in order to defraud the nation that their treasonable piece of legislation enjoys support.